Eternal Orthodox Church calendar for the 29.11 year 2017. Matthew the son of Alphaeus was at first a tax-collecter, and it was as such that the Lord saw him in Capernaum and said to him: "Follow Me!" Leaving everything, he followed Him (Matt. 9:9). After that, Matthew prepared a feast in his house, and there provided an opportunity for the Lord to voice some great truths about His coming to earth. After receiving the Holy Spirit, Matthew preached the Gospel among the Parthians and Medes and in Ethiopia, the land of the negroes. In Ethiopia, he consecrated as bishop one Plato, a follower of his, and himself withdrew to prayerful solitude on a mountain, where the Lord appeared to him. Matthew baptised the wife and son of the prince of that land, at which the prince was greatly enraged and sent a guard to bring Matthew before him for trial. The soldiers went off, but returned to the prince, saying that they had heard Matthew"s voice, but had been unable to set eyes on him. The prince then sent a second guard. When this guard drew near to the Apostle, he shone with a heavenly radiance so brilliant that the soldiers were unable to look at him, but threw down their weapons in terror and returned home. The prince then went himself. When he approached Matthew, such radiance shone forth from the saint that the prince was blinded on the instant. But the Apostle had a kind heart: he prayed to God and the prince"s sight was restored - unfortunately, only on the physical plane, his spiritual eyes remaining closed. He seized St Matthew and put him to harsh torture, twice lighting a fire on his chest, but the power of God kept him alive and unharmed. Then the Apostle prayed to God, and gave his spirit into His hands. The prince commanded that the martyr"s body be put into a leaden coffin and cast into the sea. The saint appeared to Bishop Plato and told him where to find his body in its coffin, and the bishop went and brought them back. Seeing this new marvel, the prince was baptised and received the name Matthew. He then set aside all earthly vanity and became a priest, serving the Church in a manner pleasing to God. When Plato died, the Apostle Matthew appeared to this Matthew and counselledhim-to accept the episcopate. So he became a bishop, and was a good shepherd for many years, until God took him to His immortal Kingdom. 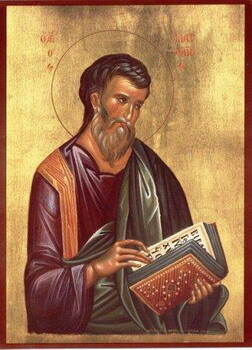 St Matthew the Apostle wrote his Gospel in Aramaic, and it was very soon translated into Greek. It has come down to us in Greek, the Aramaic original being lost. Of this Evangelist, it is said that he never ate meat, but fed only on vegetables and fruit. 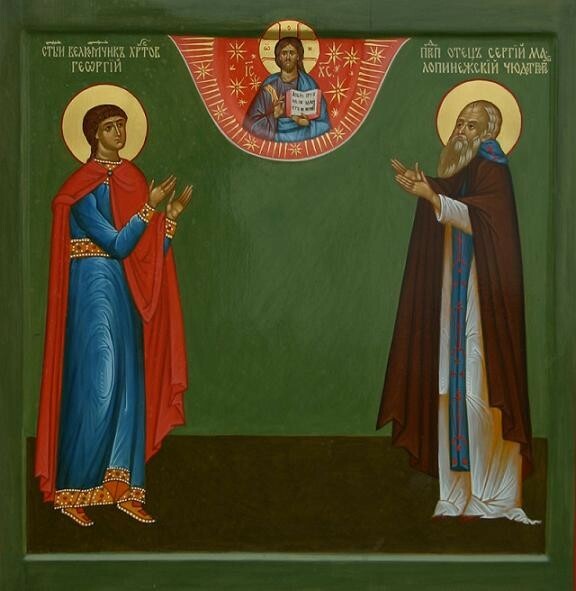 He handed over the Holy Apostle Matthew to fire, but seeing the miracles leading to the death of the Holy Apostle, believed in Christ and zealously preached the Christian faith. Later for his saintly life he became worthy of the rank of bishop. He died in peace.